From inspirational wildlife to Medieval poets, 21st Century “drunken and doomed” writers, to giants of children’s literature, Wales has a rich, cultured history to explore. So, we’ve rounded up the Top 5 literary landmarks you can visit in this beautiful country! The home of famous Swansea born poet, writer and broadcaster Dylan Thomas from 1949 -1953 – the last four years of his life – The Dylan Thomas Boathouse is not only a literary landmark, but a site of natural beauty, offering stunning views of the Taf estuary and the Gower in the distance. Having died prematurely at the mere age of 39, Thomas is now renowned for being “roistering, drunken and doomed”. However, it was at the Boathouse - in his writing shed to be specific - that he produced many of his seminal works before his rapid drunken decline, such as Over St. John’s Hill, in which he describes the view from the shed, and the birds he observes stalking their prey. 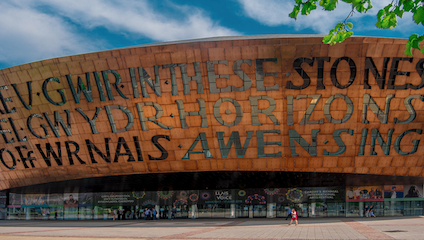 Wales’ hub for the performing arts, the Millennium Centre in Cardiff was opened in 2004, and is emblazoned with the words (in both English and Welsh) of modern Welsh poet Gwyneth Lewis stating “In these stones, horizons sing”. The centre stages a variety of dramatic performances – including the celebrated adaptation of Michael Morpurgo’s novel War Horse in July 2018 – as well as dance (poetry in motion! ), art exhibitions, musicals, comedy and opera. Renowned for its wildlife, Bardsey Island is a site of natural beauty that has, in collaboration with the Welsh Academy, offered literary residencies since 2002. One of the most famous visiting artists was Fflur Daffyd, an award winning Welsh poet, scriptwriter and columnist who produced her play Hugo, a collection of poetry and prose, and several articles whilst on the island. The island is also closely associated with poet RS Thomas, Dilys Cadwalader (the first woman to win the Crown at the 1953 National Eisteddfod for her poem, Y Llen) and painter/poet Brenda Chamberlain. Visit for a day by taking a boat ride from Port Meudwy, or book one of the island’s cottages for a week soaking up the scenery for your own personal literary inspiration. Bardesly Island is located off the Llŷn Peninsula in the Welsh country of Gwynedd. In the setting of Cardiff’s beautiful bay, The Norwegian Church was built by Norwegian settlers in Cardiff, many of whom came over as seafarers during the industrial revolution. One such settler was the father of children’s literary icon Roald Dahl. Roald Dahl was born in Cardiff in 1916, and he regularly worshiped (and was even baptised) in this very church. Now it is a community arts centre offering yoga classes, special events, musical performances and art exhibitions. And of course they’re celebrating Roald Dahl Day on 15th September! Once occupied by Cistercian monks and now in ruin, Strata Florida Abbey (which translates from Latin as the Vale of Flowers) is closely associated with Welsh Medieval poet Daffyd ap Gwilym, who is supposedly buried here under a yew tree, and is honoured with a memorial stone in the grounds. Daffyd, thought to have been born near Aberystwyth, performed poems about love and nature and is considered one of the leading poets of Middle Age Europe.